(MODEL RELEASED IMAGE). 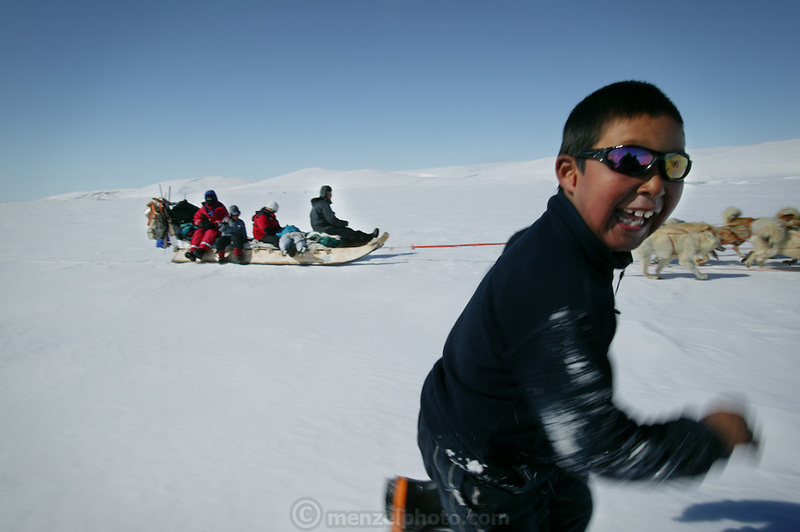 To break the monotony of dogsled travel, 9-year-old Martin Madsen runs alongside. When the snow crust is hard enough to ensure that the dogs won't break through, they can pull the half-ton weight of the sled for hours on end. On level ground, the animals pull at about the pace of a running human, but the sleds can whip down hills so fast that drivers must step on the brake at the rear of the sled to avoid running over their dogs. Martin's sister Belissa sleeps through part of the journey behind her father on his sled. Hungry Planet: What the World Eats (p. 148).